To view the important abstract of the U.S. Navy Steam Frigate USS "NIAGARA" European Civil War Cruise of 1864-65, click here. 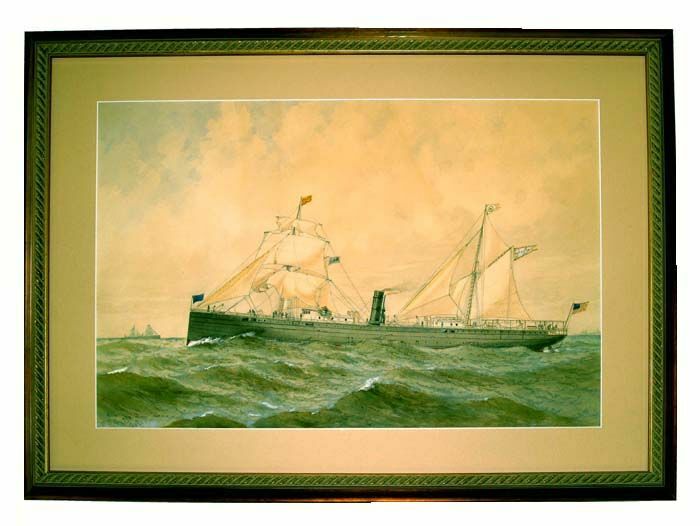 Watercolor on paper Ca 1898 Framed 33" X 24 1/2"
Presented is an outstanding water color by one of America's most celebrated marine artist-illustrators, Frederick S. Cozzens. It is a classic ship portrait of the single stack steamer, NIAGARA with auxiliary two masted sailing rig just after her purchase from the Ward Line Steamship Co. by the U.S.Navy. In Navy service she kept her same name. Here, she is showing the U.S. flag off a staff at her transom, her name pennant from her mizzen gaff, and the Ward Line's house flag a "W" in a circle from the mizzen truck. From the fore gaff fly's a light blue flag with USN. And from her foremast truck is a striped yellow and red courtesy flag which was the national flag of Cuba until 1899 indicating her plan to call on a port there . From her bow staff fly's the Union Jack. The ship is sailing close hauled on the starboard tack under all her sails from her two masts. The artist's draftsmanship and attention to detail is exceptional on this outstanding work. SIGNED: The painting is signed on the lower left, Frederick S. Cozzens. DEL after his name is an abbreviation for "Delineavit" which is from the Latin meaning "drawn by". This may date this painting as one of his earlier works. The sky is a blue-grey and overcast with dark green seas of good size running.The condition of the painting is excellent. The frame is a recent gilded replacement. WARD LINE U.S. NAVY SHIP NIAGARA: The third ship by this name in navy service was a steamer built originally for the passenger trade by John Roach and Sons, Chester, Pa., in 1877. She was acquired by the Navy from Ward Line Steamship Company on 11 April 1898 as part of a group of merchant vessels that were acquired by the Department of the Navy for service in the Spanish American War. NIAGARA was fitted out as a distilling and supply ship of the Collier Service. She was commissioned at New York 11 April 1898, with Comdr. G. A. Bicknell as commanding officer. NIAGARA departed New York 25 April 1898 for the Caribbean via Norfolk, Va., and Key West, Fla. During the Spanish American War she served the fleet off Cuba, Puerto Rico, and Haiti. The ship returned to Hampton Roads 26 May and sailed 4 days later, again bound for ports of Cuba and Puerto Rico. NIAGARA remained on station in the Caribbean Sea until 24 July when she departed Guantanamo Bay, Cuba, for New York, arriving 3 September, 1898. NIAGARA remained at New York until she decommissioned 14 October 1898. She was sold 19 July 1899. Later laid up in New York in 1906, she was chartered back to Ward Line in 1910 and 1911, and later sold to United Fruit Co. as TRUXILLO. She was transferred to Southern S.S. Co. and scrapped in the 1930s. THE WARD LINE: was officially known as the New York and Cuba Mail Steamship Company. For 115 years, the Ward Line provided freight and passenger service to Nassau, Havana, and Mexican Gulf Ports. The company played a crucial link between these ports and the New York City, and its ships played a significant role in the history of the nations they served. Many people know the Ward Line only through the Morro Castle of 1930, the liner whose tragic loss by fire in September 1934 changed Safety of Life at Sea laws forever as the single worst loss of life in U.S. peacetime history . The Ward Line was a critical link for U.S. interests in Cuba, Mexico, and the Bahamas, and they served a cross-section of the American public for nearly twelve decades. The steamship line weathered the storms of revolution, war, poor profits, fickle subsidies, tragic losses, and changing technology to serve the U.S. Merchant Marine from 1840 until 1955, and was the oldest U.S. shipping company at the time of its liquidation. THE ARTIST: Frederick S. Cozzens (1856-1928), is considered one of the best American nineteenth century marine illustrators. From 1864 to 1867, he studied at the Rensselaer Polytech Institute but did not complete the degree. He was a resident of Livingston, Staten Island, NY. Cozzens drew all types of watercraft. He is known to have sketched marine scenes as early as 1868, and exhibited at the Boston Art Club, the Mystic Seaport Association, and the Brooklyn Art Association. Cozzens contributed many illustrations to such publications as Harper's Weekly, The Daily Graphic, and Frank Leslie's Illustrated Magazine. Cozzens also exhibited at the New York Watercolor Society. In 1880 the New York Yacht Club commissioned a set of six watercolors which are still hanging in the club today. By 1883, Cozzens was a well established marine illustrator, and decided to turn his watercolors into prints. His best known works are a series of chromolithographs of his watercolors that were reproduced as a portfolio for J.D.J. Kelley's. Today, a single lithograph sell from $1800 to $2400.00 while his water colors sell for up wards of $10,000.00. OUR UNCONDITIONAL 'NO NONSENSE” GUARANTEE: If not completely satisfied with your purchase it may be returned, if without damage, within three days of receipt in its original packaging. Return items must be insured for their full value. Only a prior email authorization by us for the return is required. Shipping charges are refundable if due to our error within the continental United States. 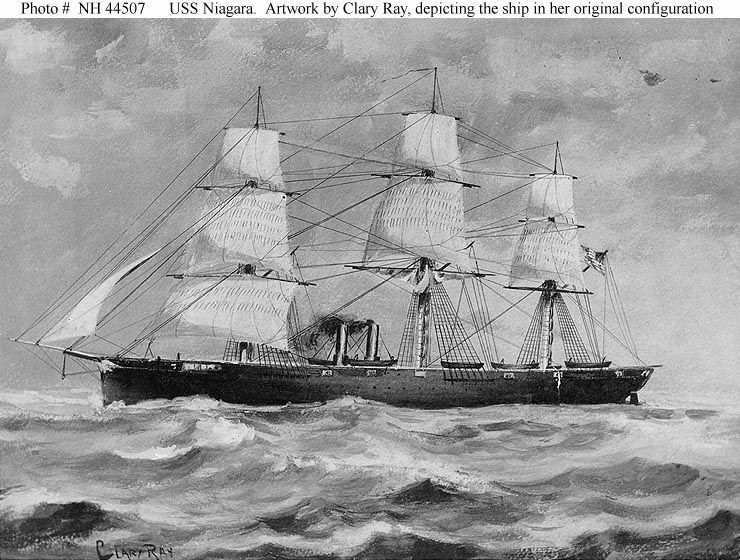 A ship portrait in the classic style of an American sailing ship scene of the 1860's.